Friday 30 September, 6- 10pm. Free. To celebrate the end of Project at Stade Hall arts programme and the month-long Coastal Currents festival; Creative Coast has devised an evening of experimental performance and arts interventions within the gallery and on the Stade Open Space. The night features the culmination of a five-day collaborative artists’ residency SALT at Stade Hall, combined with a curated programme of performance, projection and sonic interventions in the open space. Artists in Residence include: Leigh Dyer, Miranda Sharp, Kelly Best, Cathryn Kemp, Xaverine Bates and Peter Quinnell, the six artists have worked together to develop the working operation SALT- not to be missed!. Within the open space will stand prominently a large white sculptural installation by Jim Roseveare, projections and performance by artists group REPLAY and a live platform of spoken word and music by Warrior Squares, Barking Toad, and Danny Pockets & Christian Watson. Salty refreshments available to intrigue the taste buds! Hive has been a popular installation built with books and potatoes by Andover-based artist David Dixon. The piece was made especially for Stade Hall, and took several days with several volunteers to complete. 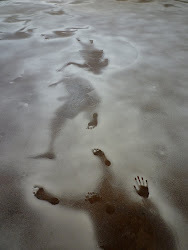 This has been a return to Hastings for Dixon, who in 2009 created a large-scale salt drawing on the floor of Bourne Hall in the Old Town for Coastal Currents. An image of this work was used as the cover for the festival brochure in 2010. Dixon exhibits nationally (including the Turbine Hall, Tate Modern). Uncertainty, impermanence & subjectivity are central to his work, which refers to modern physics & cognitive science. He often experiments with particle-based materials such as dyed rice flour & quartz powder. The use of books is also an important element to his work. As well as being multi-facetted cultural devices, rich with associations of history, knowledge, identity & memory, he uses them in a sculptural way, emphasising their phenomenological aspects. 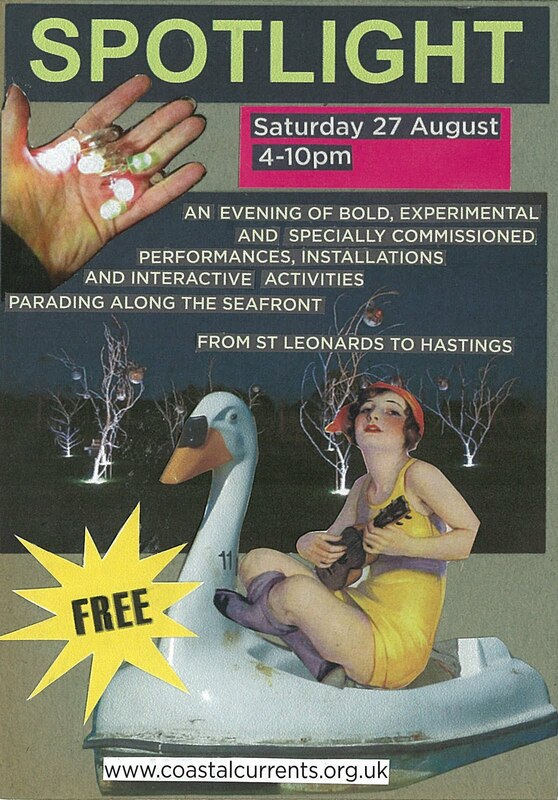 Spotlight is an ambitious evening of bold, experimental and specially-commissioned performances, installations & interactive activities parading along the seafront from St Leonards to Hastings Old Town on Saturday 27 August. 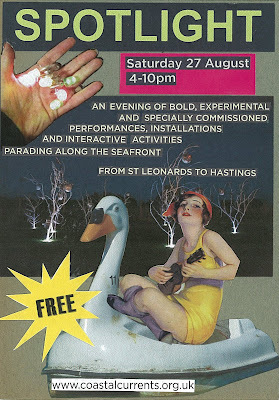 Spotlight takes place on the opening weekend of the Coastal Currents arts festival, starting at 4pm at St Leonards Gardens with an installation 'Liquid Glass'. The musical procession moves along the promenade to Bottle Alley, joined by the Bohemia Ukulele Orchestra, then the pier, where decorated cyclists Pier to Eternity climb on board. The parade continues past a large choir based on the swan boating lake, to Stade Hall and Open Space, where the festival is launched with speeches and refreshments, and where a number of performances and free activities will be taking place. These include Jenny Edbrookes 'Smalls' installation & performance, free LED badge-making, traditional seaside games, a pop-up metal detector museum with Eight Foot Square, paper couture dresses, 'Cabinet of Wonder' theatrical life drawing sessions, a tightrope show and the Coastal Currents taster exhibition, with a selection of work from throughout the festival on show. The final leg of the procession takes participants through a sound installation in the Harold Place Underpass to Wellington Square Gardens, where Radiator Arts will have a large illuminated sculptural installation, 'The Lost Plot'. We encourage as many people to come along and to join in. Liquid Glass is on the look out for singers and noise-makers for the early leg, and the Ukulele Orchestra encourage you to bring your own instrument tuned GCEA, to play along to a giant C6 chord. Artist Maika Crampton will be running a paper couture workshop on Thursday 25, 6-9pm- come along to make a paper hat or fascinator, and wear it to Spotlight on the 27th. 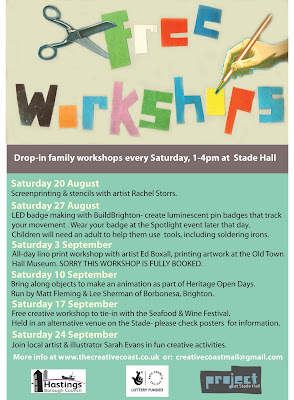 BuildBrighton will be running two free LED badge-making workshops- one at 1-4pm and one in the evening. We recommend you book to guarantee a place. These free drop-in workshops run at Stade Hall every Saturday afternoon from 1-4pm, and are suitable for all ages. Materials provided. The only exception being Ed Boxall's print workshop on Saturday 3rd September, which is now fully booked, sorry. The LED badge-making workshop on 27 August is not suitable for very young children as it involves using soldering irons. Older children very welcome, with adult supervision. On Saturday 17 September we will re-locate due to the Seafood & Wine festival. See online and posters at Stade Hall for further information. A series of free workshops at Stade Hall coming up between now until the end of September. All workshops are free, but please book on to the adult ones, so we can gauge numbers for materials etc. Movement is essential to our lives and is our expression. This workshop explores our field of perception through movement. Reconnecting the mental, physical and emotional body through game, relaxation and partner work we will be looking at our internal and external world and how they are connected to inform our imagination. Participants are encouraged to apply this material to their own practice and are asked to bring their own tools such as drawing, painting, writing materials and a camera. Please wear comfortable clothes to move around. Create your own paper hat or fascinator with Maika Crampton. You are encouraged to wear your hat or fascinator with pride at the Spotlight event on Saturday 27 August at Stade Hall. A workshop that explores ways in which new images and visual narratives can be generated from a piece of text and objects. The workshop will follow a set of exercises that experiment with image making and the relationship between image and text. 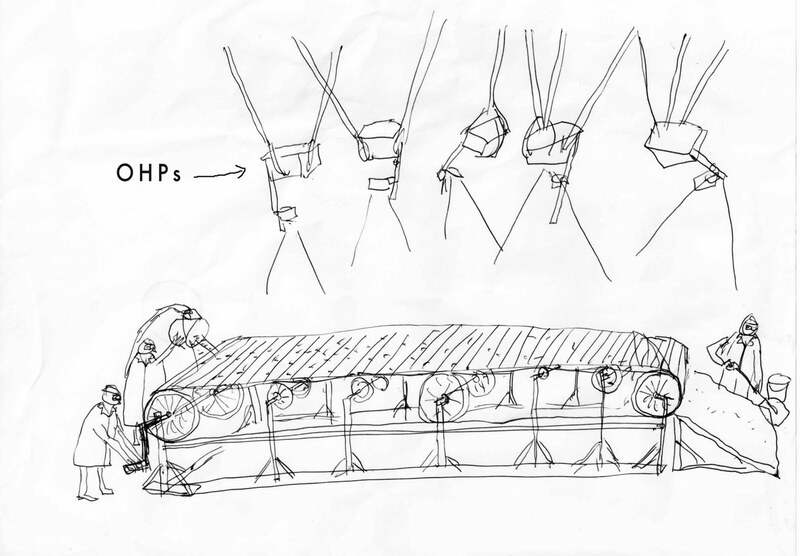 The aim is to create new ways of working and produce unexpected outcomes. Materials will be provided or participants are welcome to bring their own. 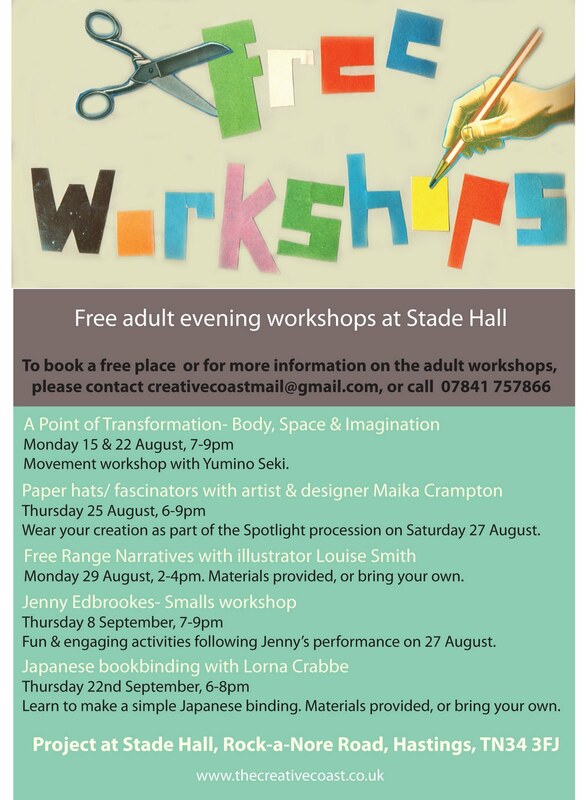 For those of you who were wowed by Jenny Edbrooke's 'Smalls' performance at Spotlight, Jenny is going to be running a free workshop on Thursday 8th September, 7-9pm at Stade Hall. Jenny invites you to join her in working with an amusing array of mixed media, creative writing and performance making techniques to create a unique piece of art that you can take away and cherish as a personal reminder of the sacredness of your underwear secrets. This workshop will teach you how to bind a simple soft cover book by hand. Materials will be provided, but if you have any papers you would particularly like to use, or strong thread or ribbon for the binding, then feel free to bring these along. The Coastal Currents arts festival is fast approaching, and one of the first visible signs is the Promenade project. 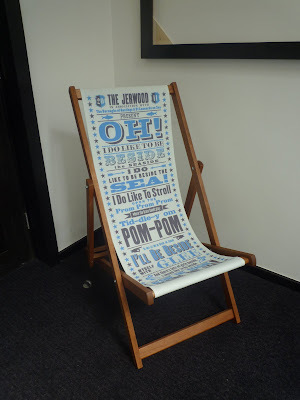 Eight recognised artists with a connection to the region were invited to donate an image to be made into double-crown sized promenade posters which have been displayed along the seafront in Hastings and St Leonards. The images have also been reproduced and distributed in local shops/ cafes/ galleries etc 10,000 free collectible postcards. Jake & Dinos Chapman, Maggi Hambling, Billy Childish, Ben Eine, Andrew Kotting & Iain Sinclair, Martin O'Neill, Debi Angel & local printmakers Aardvark. This was a collaboration between Creative Coast & zeroh (pictured above). Zeroh also helped on the festival branding this year, and designed the brochure front cover. See here for more on the project as featured in the Hastings Observer. 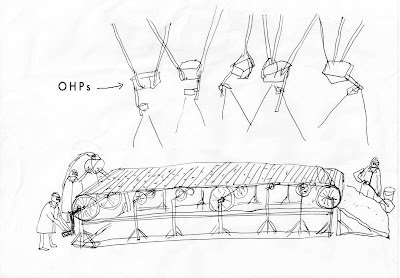 In 2011 the Stade Education Project launched a competition for the public to design new deck chairs for the Stade. Over 1,000 people entered & twenty winners were chosen at a selection day held at Stade Hall. 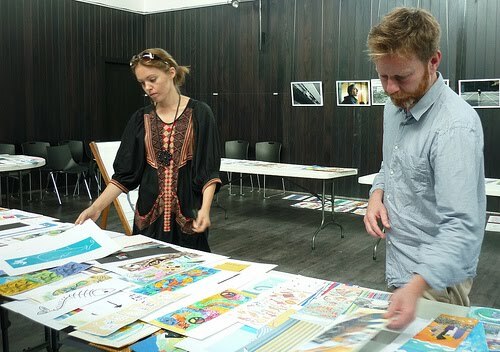 Judges were Liz Gilmore, Director of Jerwood Gallery, Hastings; David Rhodes, curator at the De Le Warr Pavilion & Cllr. Trevor Webb, Hastings Borough Council. One of the designs (above) by Nathan Usmar Lauder of St Leonards is on display in the Stade Hall foyer. All twenty designs can be seen at an exhibition at Sussex Coast College (12th - 16th September) and at the Seafood & Wine Festival on the weekend of 17th/ 18th September, on the Stade Open Space. Creative Coast is managed by Sarah Yates & Lorna Crabbe. A visual arts company based in the South East.